Looks like Salad Monday has became Sandwich Monday. Ok so I saw this sandwich on Shutterbean and had some version of a meltdown because it looked SO amazing that I knew I had to have it. But I have to tell you, this recipe, calls for goat cheese. I don’t know if you know this but goat cheese is freaking expensive. Like a tiny amount cost me SGD13. I don’t know about you but SGD13 is a lot of money. I mean I could buy like a salad in a mall for that money. Or watch one movie on the weekend. Ok. Clearly living in Singapore is not exactly a value-for-money type situation. Blend all the ingredients together in a food processor. Toast the bread to your level of toastiness. 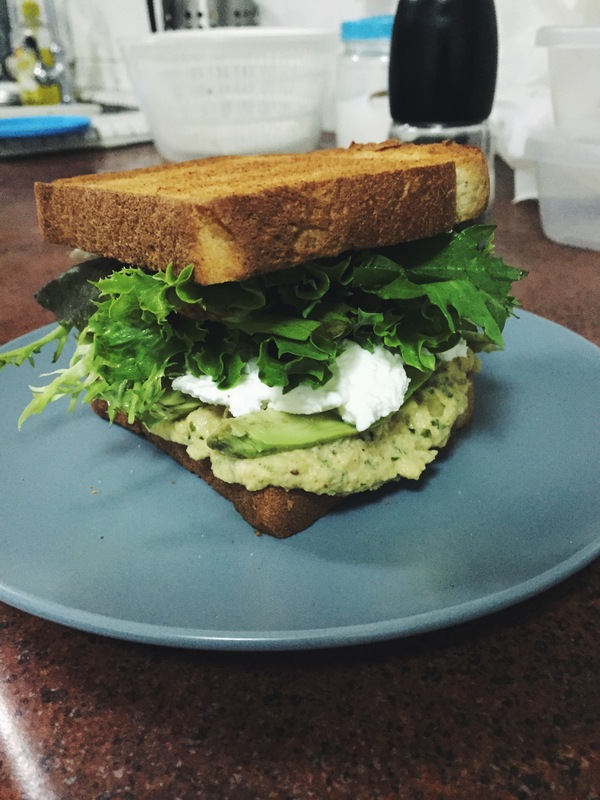 Spread one side of bread with the Cilantro Hummus. Top with the sliced avocado. Top that with the goat cheese. Top that, carefully, with the mixed salad. Top with the second half of bread. *Disclaimer: I ate this with a boiled egg because let’s face it. Ain’t nobody got time to be vegan.